Happy return: Junior Adam Scott took the second-half kickoff against Lafayette for a touchdown. 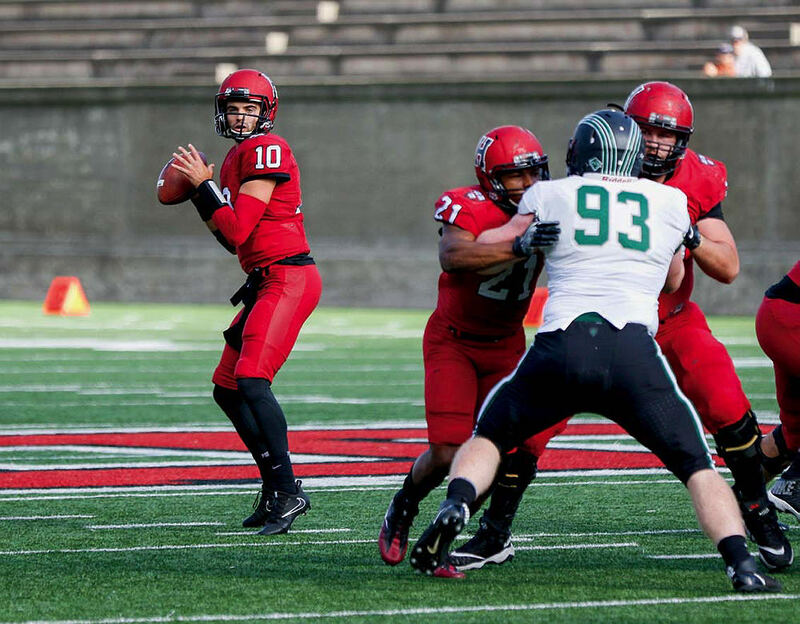 Mister Precocity: Freshman quarterback Jake Smith engineered a comeback win against Dartmouth. Grab and go: Junior wideout Henry Taylor went over Columbia’s Landon Baty for a catch that became a 65-yard touchdown. In the middle of the second quarter of the 134th playing of The Game, heavily favored Yale had just forged ahead of Harvard 7-3 on a nine-yard touchdown pass from quarterback Kurt Rawlings to wideout JP Shohfi. Now freshman Crimson quarterback Jake Smith was looking to get those points back. On second down and 17 from the Harvard 16, Smith ran an option play to the left. After gaining a few yards, he tried to pitch the ball to freshman halfback Aaron Shampklin—but threw it behind him. The ball bounded free and was scooped up on the 19 by the Elis’ Malcolm Dixon, who ran unimpeded into the end zone. When Alex Galland booted the extra point, Yale led 14-3. The two touchdowns in 55 seconds set the tone for the game, in which the Elis cruised to a 24-3 victory. Only a staunch effort by the Harvard defense kept the margin from being greater. The loss dropped the Crimson to 3-4 in the Ivy League, tying Harvard for fifth place with Cornell, and 5-5 overall. This was the first season since 2000 that the Crimson had not won at least seven games. Yale’s victory—its second straight in The Game—gave the Elis a 6-1 league mark and a 9-1 overall finish. The triumph also allowed the Bulldogs to hold off Dartmouth and surprising Columbia and bring to New Haven Yale’s first outright Ivy title since 1980. The Crimson did not score a touchdown in the final nine quarters of the 2017 season, the longest such stretch of futility since the 1986 season, when Harvard suffered three straight shutouts. This was a rackety, roller-coaster season, one replete with struggles. Murphy tried two quarterbacks, Smith and fifth-year senior Joe Viviano. Each had his moments, but mainly, the football adage held: If you have two quarterbacks, you have no quarterback. The offense worked fitfully, and once foes began to key on stellar junior back Charlie Booker III, the running game became predictable and less productive, gaining a pedestrian 122.3 yards per game in Ivy clashes. (Booker missed the Yale game because of an injury.) 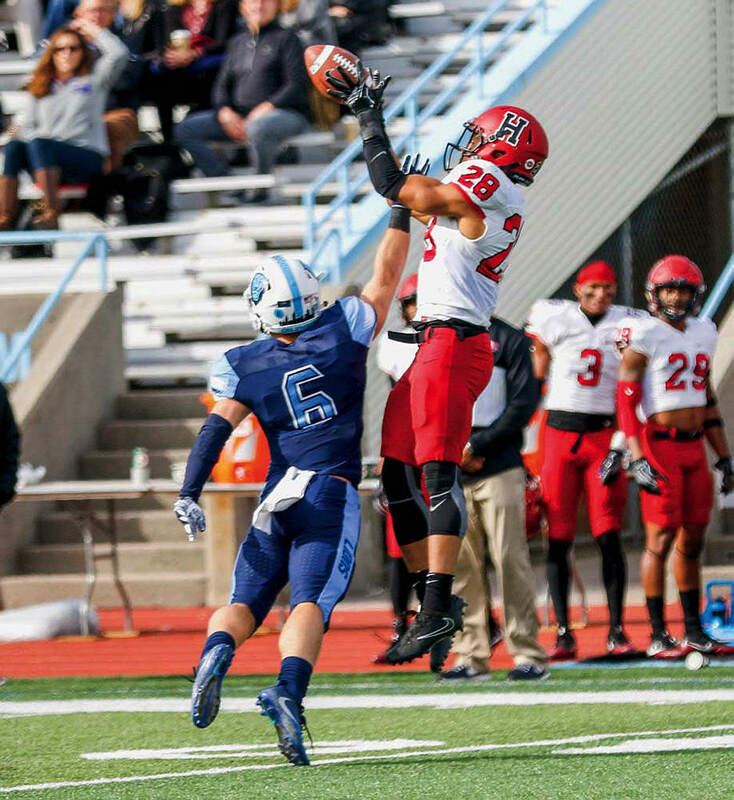 With the rushing attack unable to keep rival defenses honest, opponents often were able to devote double-coverage to the Crimson’s two star wide receivers, juniors Justice Shelton-Mosley and Adam Scott. Shelton-Mosley, who had averaged six catches a game in 2016, averaged 3.6 in ’17. In ’16 Scott had averaged 6.4 receptions, in ’17, only 2.3. Sorely missed were two of 2016’s drive sustainers: solid senior running back Semar Smith (out for the season with a foot injury) and All-Ivy tight end Anthony Firkser ’17, the classic “possession receiver,” who made many eye-popping catches on third downs. The defense also suffered key injuries—most notably, to its best sacker, junior defensive end DJ Bailey. But led by senior linebacker (and captain) Luke Hutton, and the redoubtable senior defensive back trio of Tim Haehl, Tanner Lee, and Raishaun McGhee, the D hung in there valiantly. There were no easy games. Complicating matters was parity. The Ivy League was at its most balanced ever, “the strongest top-to-bottom in the 24 years I’ve been here,” said Murphy. With two weeks left in the season, seven teams (all except Brown) had a mathematical chance to share the title. For all its difficulties, Harvard won a couple of games it probably should have lost. The next two weeks seemed to promise business as usual: a 45-28 victory over Brown in the home opener, and a 41-2 thrashing of overmatched Georgetown at RFK Stadium in Washington, D.C. (see “A Rugged Start,” November-December 2017, page 38). Which is why it was a distinct shock the following week when the Crimson traveled to Ithaca, New York, and came away with a 17-14 loss to Cornell. In the Ivy preseason poll, which had tabbed Harvard as co-favorite with Princeton, the Big Red had been picked to finish dead last. The early going seemed to confirm that so-called wisdom. On Harvard’s first series, Jake Smith, making his third straight start, took the Crimson 72 yards in six plays for a score. Harvard built its lead in the second period. Facing a third-and-13 from the Big Red 36, coach Murphy ordered a timeout. What he drew up worked brilliantly. On the next play, Smith found senior tight end Jake Barann wide open in the middle of the field. Barann made a finger-tip catch and ran into the end zone. Harvard 14, Cornell 0. But with 40 minutes left to play, the Crimson had scored its final point. As the Big Red tallied 17 unanswered points, the remainder of the game uncovered two weaknesses that would plague Harvard the rest of the season: the inability to mount drives, and the failure to stop the opponent’s elite runner. Chris Walker, the Big Red’s All-Ivy running back, did an impressive Ed Marinaro imitation, time and again ripping through the line. He finished with 93 yards on 19 carries. Those rushes helped Cornell win the time-of-possession battle by a staggering 36:50 to 23:10; on the season, Harvard’s possession time In Ivy games averaged a substandard 27:51. The Big Red ran 77 offensive plays to the Crimson’s 44. The Harvard offense’s inability to stay on the field in the second half had a fatal corollary on this unseasonably warm day: its hard-pressed defense wore down. It didn’t help that the Crimson was missing three injured starters: Bailey, senior defensive tackle Stone Hart, and junior linebacker Anthony Camargo. 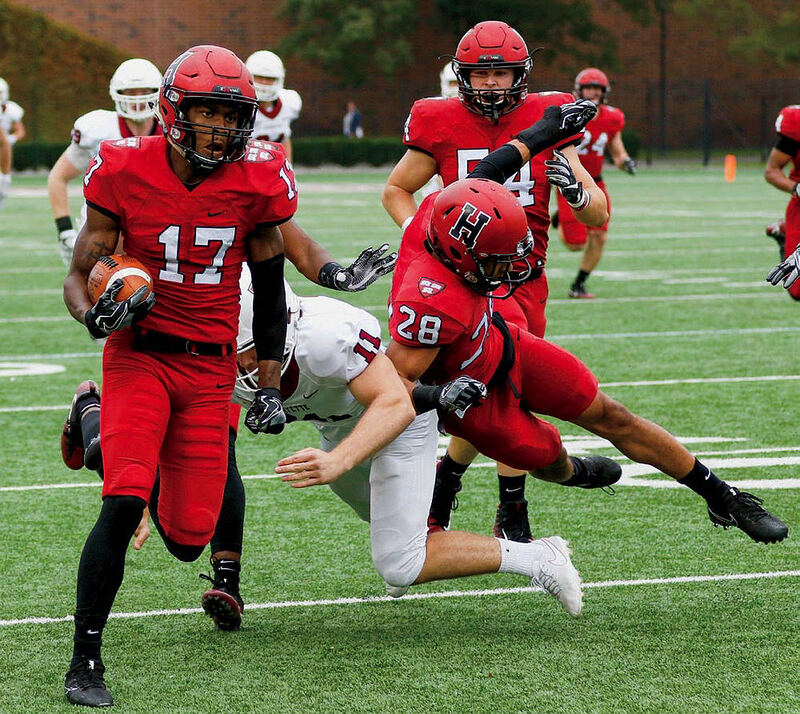 The next week brought the 700th game played at Harvard Stadium, and the Crimson celebrated by whipping non-league foe Lafayette 38-10. 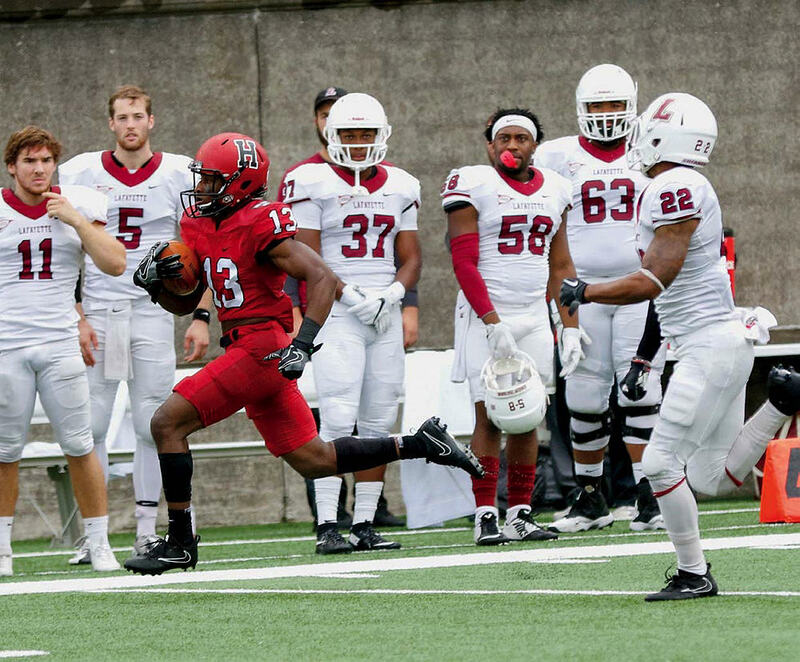 Shelton-Mosley ignited Harvard with an 85-yard punt return for a score. In the first period, after the Crimson defense forced the Leopards into a three-and-out, Lafayette’s Michael Turk boomed a high, 50-yard punt to the Harvard 15. Shelton-Mosley fielded it and, sprung by a dandy block by junior Noah Reimers, wove his way upfield along the Crimson sideline, then outran the final pursuers to score. This was Shelton-Mosley’s third career punt return for a touchdown. On the second-half kickoff, Scott produced another Harvard happy return—or, as Murphy refers to a kick return for a touchdown, “a house call.” Scott grabbed the football on the Crimson 10. Keyed by a downfield block from Shelton-Mosley, he was off to the races. For one Saturday afternoon, all seemed back on track. It wasn’t. The following Friday night in the Stadium, Princeton obliterated Harvard 52-17. The 52 points allowed were the most by an opponent in the Murphy era. The margin of defeat was the largest since a 52-13 demolition at Penn in 1988, and the largest loss since 2002, when the Crimson was drubbed 44-9 at Penn. It was also Harvard’s first defeat in a Stadium night game after 14 wins. That evening, there was no stopping the quick-snapping Tigers and their quarterback Chad Kanoff. In building a 31-10 halftime lead, the Tiger senior was scorching, completing his first 20 passing attempts. (He added another completion in the second half before his string was snapped; at game’s end he was 31 for 35, for 421 yards and two touchdowns.) Harvard’s Smith did his best to riposte, but it was like a good middleweight trying to counter a superb heavyweight. The youngster kept on flinging, and finished a creditable-looking 20 for 31 passing, for 268 yards. Still, it seemed that Princeton was ready to ramble not only to the Ivy title but to the Super Bowl. Instead, the Tigers unaccountably lost their next four and finished in seventh place. Go figure. Amazingly, given all the Sturm and Drang, Harvard still had a chance to gain a share of the Ivy title. Those hopes were snuffed out by a lackluster home effort against Penn. The Quakers scored on their first offensive play—a 77-yard run by Tre Solomon—and dominated throughout a 23-6 victory. The game, in which Harvard’s only points came on two field goals by sophomore Jake McIntyre, marked the first time the Crimson failed to score a touchdown since September 19, 1998, when Harvard was shut out at Columbia 24-0. At the end of the third period, Murphy performed another quarterback shuffle, replacing Viviano with Smith, to little avail. “We never really had any great momentum offensively,” Murphy said. For all that, the Crimson had its chances. “But we did not capitalize on our opportunities,” the Harvard coach summed up. The following week, in The Game, the Crimson’s high-water mark came on their first offensive series. Smith engineered an 11-play, 55-yard drive that featured three completions to Shelton-Mosley, the first for 21 yards, the second for nine, and the third for 18. (Shelton-Mosley finished with a game-high seven grabs, for 77 yards.) This seemed like a plan, especially in the absence of Booker. But as so often happened late in the season, the drive bogged down in the shadow of the opponent’s goal. So McIntyre came in and drilled a 29-yard field goal. Harvard 3, Yale 0. Follow the Crimson all season long! David L. Tannenwald ’08 will provide the latest news, game summaries, and insights as the Crimson chase an Ivy title. Thus pretty much concluded the Crimson offensive portion of the day. Harvard was limited to 164 yards gained, minuscule by any standard. At the beginning of the fourth quarter, the Bulldogs enlarged their lead to 24-3 on a two-yard run by Zane Dudek. The day was Blue indeed. The momentum of The Game, for nine years in Harvard’s favor, has now swung. Likewise, after having dominated the league for so long, the Crimson is 3-6 in its last nine conference games, and the overall victory total has fallen in successive years from 10 to nine to seven to five. So in 2018 Harvard will face not only a more rugged league but also a challenge it has not encountered in some time: a bounce-back season. Tidbits: Defensive back Zach Miller ’18 (’19), of Houston and Winthrop House, was elected the 145th captain of Harvard football, for 2018. During the 2017 season Miller, whose field of concentration is economics, was credited with 8.0 tackles….Six Harvard players received All-Ivy recognition. Junior Justice Shelton-Mosley, the league’s top punt returner, was a unanimous first-team selection as a special-teams player. Junior running back Charlie Booker III was also named to the first team. Three seniors—defensive lineman Stone Hart, linebacker Luke Hutton and defensive back Tanner Lee—were named to the second team. Junior defensive lineman Richie Ryan received honorable mention….The 145th season of Crimson football will kick off on September 15 at Harvard Stadium against San Diego. And mark your calendars: the 135th playing of The Game—coinciding with the golden anniversary of Harvard beating Yale 29-29—will take place on November 17 at Fenway Park.